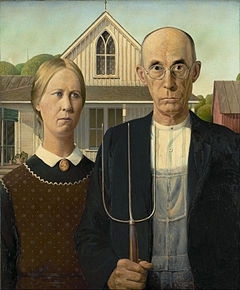 The American Gothic, the celebrated work of Grant Wood in 1930, shows farmers outside their home, posing with a pitchfork. 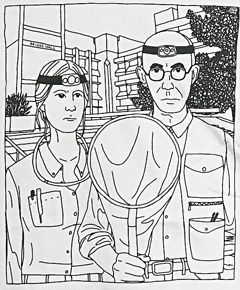 This is a close-up of Jill Oberski's rendition of the American Gothic: entomologists with nets instead of farmers with pitchforks. What's a picnic without bugs? When the 105th annual UC Davis Picnic Day takes place Saturday, April 13, thousands of visitors will explore the campus. It promises to be informative, educational and entertaining. But over at Briggs Hall, home of the UC Davis Department of Entomology and Nermatology, “special guests” will include bugs. There will not only be cockroach races, maggot art, and displays of bees, ants, aquatic insects—and more!—but huge images of vectors, the incredible macro photography of medical entomologist/geneticist Geoffrey Attardo, assistant professor, UC Davis Department of Entomology and Nematology. Attardo will be demonstrating “Virtual Reality Bugs” where youths and adults can watch 40-foot tall, three-dimensional insects and spiders. 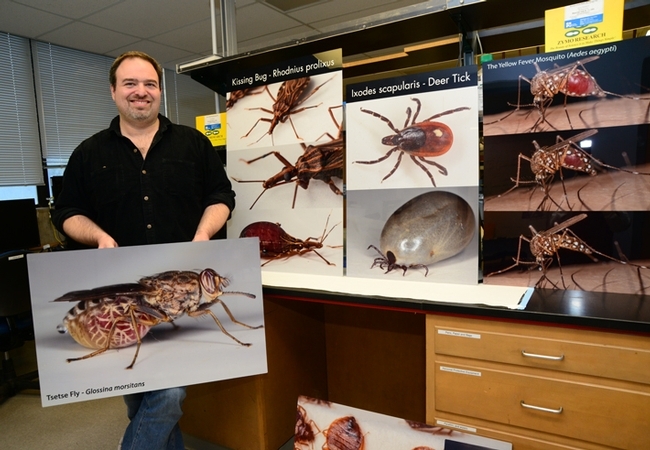 And in his medical entomology display, he will be exhibiting metal prints of vectors, including a tsetse fly, kissing bug, deer tick, mosquito, stable fly, cat flea and bed bug. You wouldn't want to encounter a bed bug in your bed, or a flea or tick on your dog, or a mosquito on your arm. You may not even know what they look like up close. But with these images, you can see what's bugging you or your pets. 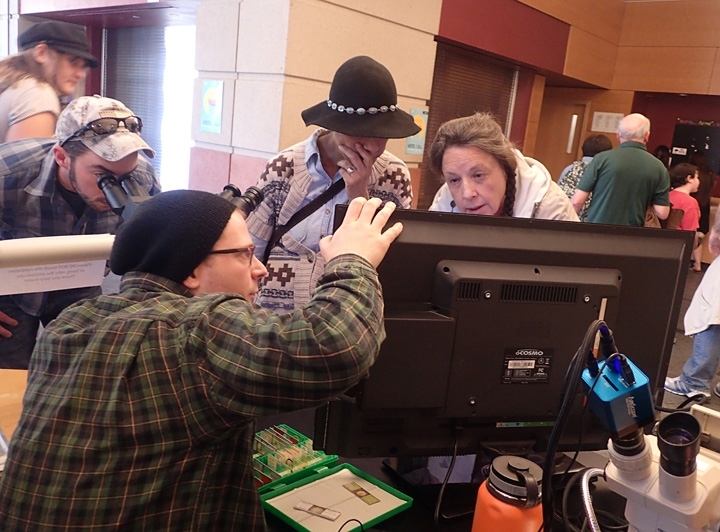 And with the Virtual Reality Bugs, participants can select what they want to see--or what's towering over them. The list includes a black widow spider, ant, beetle, grasshopper, damsel fly, cicada, cockroach, and a tsetse fly. Each person will be limited to about 30 seconds to accommodate the crowd. The Briggs Hall activities run from 9 a.m. to about 4:30, while activities at the Bohart Museum of Entomology, will be offered from 11 a.m. to 2 p.m. But back to the vectors. 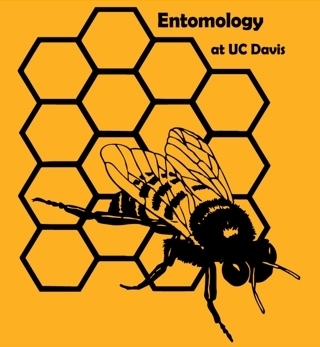 Did you know that the Bohart Museum provides information or fact sheets on its website at http://bohart.ucdavis.edu/insect-info-sheets.html? You can learn about some of the vectors that will dwarf you when you visit Briggs Hall. "Many ticks seek hosts by 'questing.' Questing ticks crawl up the stems of grass or perch on the edges of leaves in a typical posture with the front legs extended. Certain chemicals, such as CO2, as well as heat and movement cause questing behavior. Ticks climb onto a potential host that brushes against their extended front legs. Once on a host hard ticks may feed for several days to several weeks. "The most common flea found on household pets, such as cats and dogs, is the cat flea, Xenopsylla cheopis." Read the Bohart fact sheets and then check out Attardo's images. 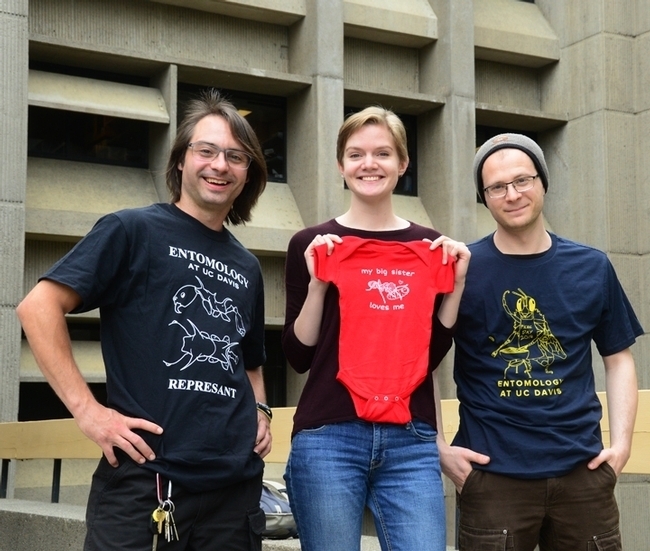 If you'd rather wear your bug on your shirt, the Entomology Graduate Student Association (EGSA) can oblige. They have scores of insect-themed t-shirts, ranging from beetles and honey bees to wanna bees. The newest t-shirts in the line-up include two designed by talented doctoral student/ant specialist Jill Oberski of the Phil Ward lab. One is a take-off of American Gothic, the 1930 painting by Grant Wood, except with entomologists holding a net in front of Briggs Hall, UC Davis campus, instead of the farmers holding a pitchfork in front of their farmhouse. The other Oberski t-shirt celebrates the 45th anniversary of UC Davis Picnic Day cockroach races. Roaches rock! Forensic entomologist Robert Kimsey, co-chair of the department's displays at Picnic Day, rears cockroaches in his lab, but on Picnic Day, they're ready to race! Doctoral candidate Brendon Boudinot, EGSA president and co-chair of the department's displays, says the roaches will race on a new racetrack. 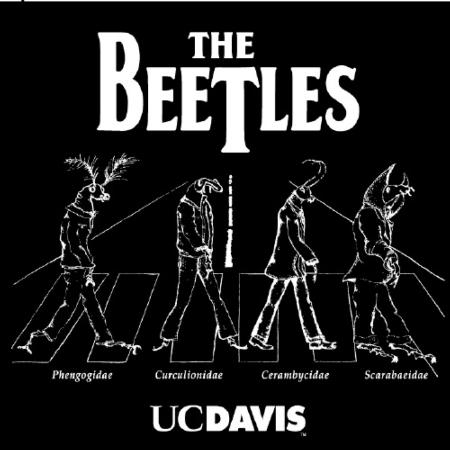 Doctoral student/nematologist Corwin Parker of the lab of Steve Nadler, professor and chair of the UC Davis Department of Entomology and Nematology, also came up with a clever idea for a t-shirt. You know how cicadas can be REALLY loud? He drew one plugged into an amp. Now, that's REALLY loud! You can buy EGSA t-shirts at Briggs Hall on Picnic Day or order them online at https://mkt.com/UCDavisEntGrad/ after Picnic Day. Some of the EGSA t-shirt designs. Insects are in. They're not only everywhere in nature (well, almost everywhere! ), they've climbed, crawled, jumped, buzzed, fluttered, flew or otherwise positioned themselves on fashions, including the UC Davis Entomology Graduate Student Association (EGSA) t-shirts. The EGSA, comprised of UC Davis graduate students who study insect systems, is an organization that "works to connect students from across disciplines, inform students of and provide opportunities for academic success, and to serve as a bridge between the students and administration," according to EGSA president Brendon Boudinot, an ant specialist/doctoral student in the Phil Ward lab. As a year-around fundraising project, they sell t-shirts, which can be viewed and ordered online at https://mkt.com/UCDavisEntGrad/. Jill Oberski, a graduate student in the Phil Ward lab, serves as the t-shirt sales coordinator. She can be reached at jtoberski@ucdavis.edu. Boudinot's award-winning design is REPRESANT, with illustrations by colleague Eli Sarnat, an alumnus of the Ward lab. One of the favorite bee t-shirts was designed by Danny Klittich, who holds a doctorate in entomology from UC Davis and now works as a California central coast agronomist. "The Beetles" t-shirt is EGSA's all-time best seller. Instead of the English rock band John Lennon, Paul McCartney, George Harrison and Ringo Star crossing Abbey Road in single file (that's the iconic image on the cover of their album, Abbey Road), think of The Beetles (four insects) crossing Abbey Road in single file. Beneath the images of the beetles are their family names: Phengogidae, Curculionidae, Cerambycidae and Scarabaeidae. Think glowworm, snout, long-horned, and scarab beetles. One of the favorite bee t-shirts depicts a honey bee emerging from its iconic hexagonal cells. It's the 2014 winner by then doctoral student Danny Klittich, now a California central coast agronomist. EGSA is heading for the Entomological Society of America annual meeting in November. In addition to their participation, the graduate students will be selling shirts at the meeting, appropriately themed "Sharing Insects Globally." It's set for Nov. 11-14 in Vancouver, B.C. 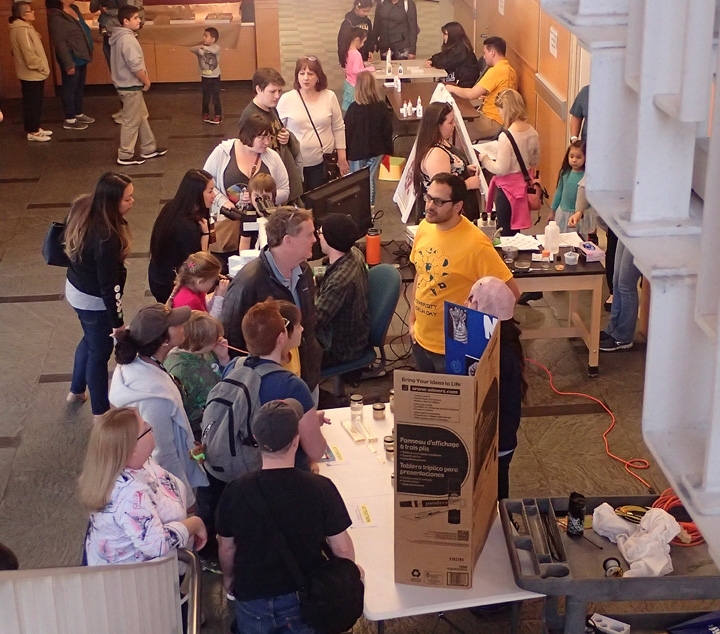 The EGSA also sells its t-shirts at other events, including at Briggs Hall during the annual UC Davis Picnic Day. Insects rock. But some climb, crawl, jump, flutter, buzz, fly or otherwise position themselves on EGSA t-shirts. It's National Pollinator Week: Do You Know Where Your Bee T-Shirts Are? This is a favorite among bee enthusiasts. It's the work of former UC Davis graduate student Danny Klittich, now a Ph.D working as a California central coast agronomist. You've heard the phase, "wear your heart on your sleeve"--which means to show your emotions openly. How about wearing a pollinator on your heart? 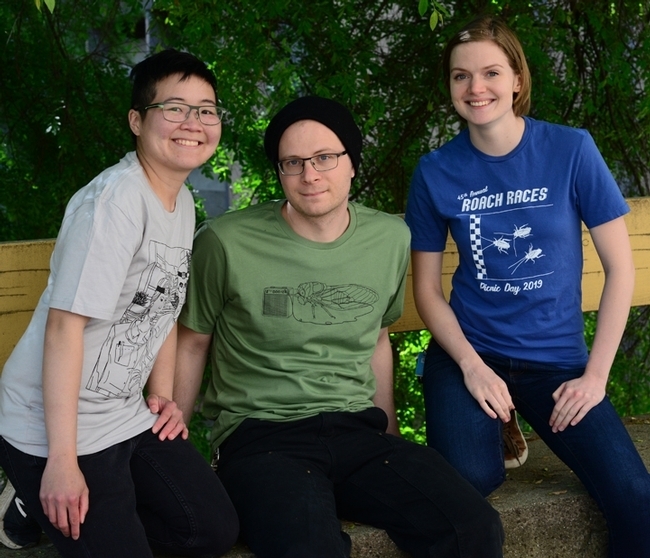 The UC Davis Entomology Graduate Student Association (EGSA) offers a wealth of t-shirts as part of its year-around fundraising efforts. It's for a good cause. The EGSA, comprised of UC Davis graduate students who study insect systems, is an organization that "works to connect students from across disciplines, inform students of and provide opportunities for academic success, and to serve as a bridge between the students and administration," according to EGSA president Brendon Boudinot, an ant specialist/doctoral student in the Phil Ward lab. 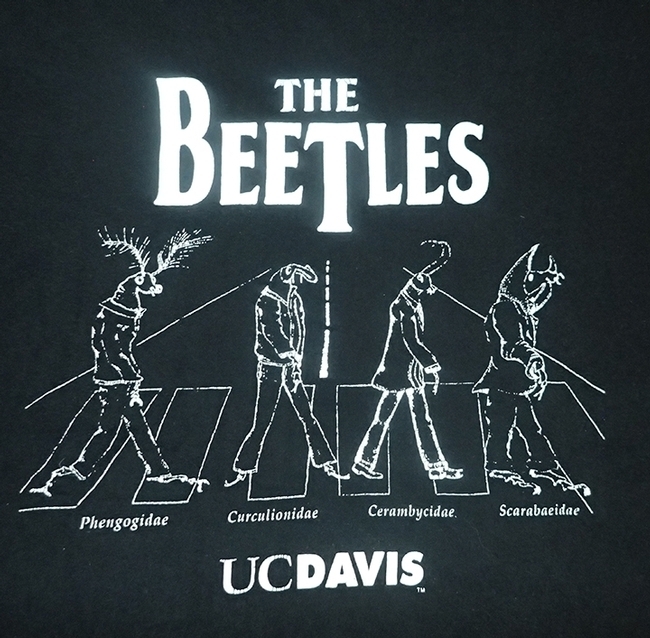 The t-shirts can be ordered online at https://mkt.com/UCDavisEntGrad/, according to medical entomologist and EGSA treasurer Olivia Winokur, a doctoral student in the Christopher Barker lab. She serves as the t-shirt sales coordinator and can be reached at ocwinokur@ucdavis.edu. One of the favorite bee t-shirts depicts a honey bee emerging from its iconic hexagonal cells. It's the 2014 winner of then graduate student Danny Klittich, who recently received his doctorate in entomology from UC Davis and now works as a California central coast agronomist. Pollinators also include butterflies, birds and beetles. One thing's for certain: Pollinators matter. Not just during National Pollinator Week but every day of the year. "The Beetles" t-shirt is the EGSA's all-time best seller. Instead of the English rock band John Lennon, Paul McCartney, George Harrison and Ringo Star crossing Abbey Road in single file (that's the iconic image on the cover of their album, Abbey Road), think of The Beetles (four insects) crossing Abbey Road in single file. Beneath the images of the beetles are their family names: Phengogidae, Curculionidae, Cerambycidae and Scarabaeidae. Think glowworm, snout, long-horned, and scarab beetles. 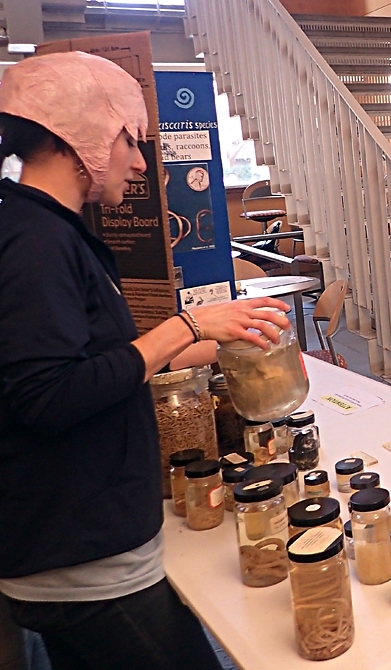 What was diagnostic parasitologist Lauren Camp of the UC Davis Veterinary Medical Teaching Hospital wearing on her head as she talked about the nematode collection last Saturday at the seventh annual UC Davis Biodiversity Museum Day? That would be entomologist Ivana Li, a UC Davis biology lab manager who received her bachelor's degree in entomology from UC Davis in 2013. 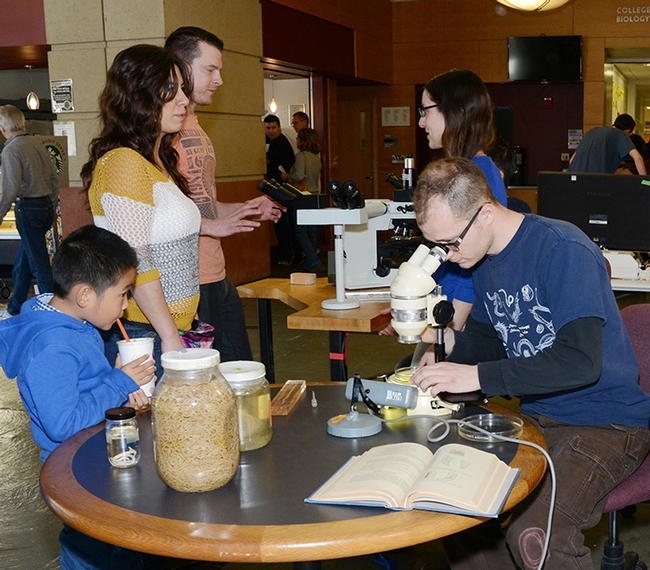 Among nematologists staffing the collection, displayed from 1 to 4 p.m. in the Sciences Laboratory Building, were graduate students Corwin Parker and Chris Pagan, who study with major professor Steve Nadler. Camp, who hails from rural northern Indiana, first became interested in parasites as an undergraduate student at the University of Chicago, where she received her bachelor's degree in biology in 2005. She went on to earn her master's degree in biology from Wake Forest University in 2007 and her doctorate from UC Davis in December 2017. Her doctoral research focused on the genetic characterization of raccoon roundworm, a zoonotic nematode, in North America. Camp joined the Clinical Diagnostic Laboratories Parasitology Lab in August 2017. Her responsibilities include looking through feces to find and identify parasites. “Many of these parasites are nematodes,” she points out. "My specific interest in nematode parasites developed when I read some of Dr. Nadler's work on the evolutionary relationships of nematodes for an invertebrate biology class," she related. Nematologists are accustomed to answering "What's a nematode?" 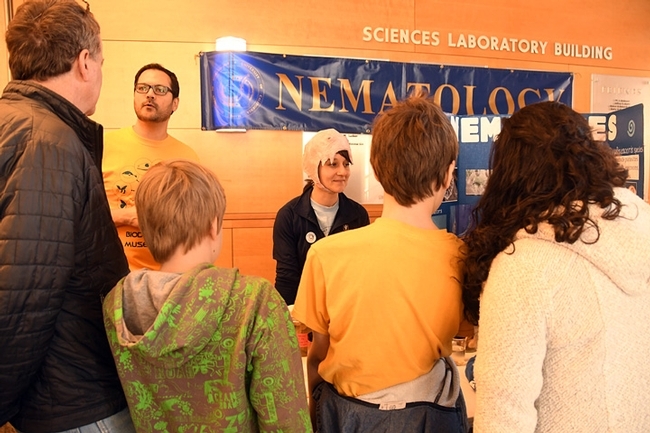 “Nematodes are an amazing phylum of organisms--they exist in almost every known environment on the planet, and different species eat everything from bacteria and fungi to plant and animal tissue," Camp told us back in 2017, prior to setting up a display at the Bohart Museum of Entomology open house on Parasite Palooza. "I find parasites particularly fascinating, because they are dependent on another organism (or organisms) for part or all of their life cycle." 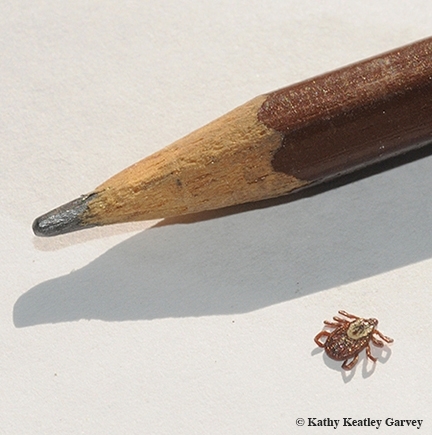 How much do you know about ticks? How much do you know about nematodes? You'll be able to learn more about both, plus fleas, mites, lice, bed bugs, botflies and other critters, when the Bohart Museum of Entomology of UC Davis hosts an open house on “Parasite Palooza: Botflies, Fleas and Mites, Oh, My” from 1 to 4 p.m., Sunday, Jan. 22 in Room 1124 of the Academic Surge Building, Crocker Lane. It's free and open to the public. You can meet scientists one-on-one and ask questions. Senior public health biologist Mike Niemala of the California Department of Public Health will participate in the three-hour open house, discussing ticks and other health issues, and handing out fliers and brochures. He received his master of science degree from UC Davis. 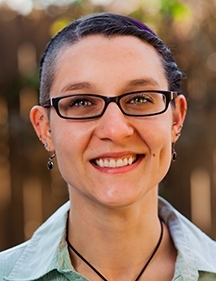 Nematologist Lauren Camp, awarded her doctorate in December from UC Davis, will discuss nematodes. She studied with major professor Steve Nadler, professor and chair of the UC Davis Department of Entomology and Nematology. What are nematodes? That's a question often asked of nematologists. "Nematodes are a large group (phylum) of roundworms," Camp said. "Most nematodes are not parasites, but people may be familiar with some of the parasitic species. Some well-known nematode parasites of humans are pinworm, Ascaris, hookworm, and guinea worm. Dogs and cats can also become infected with nematodes including heartworm, hookworm, or Toxocara." Camp, who grew up in rural northern Indiana, received her bachelor's degree in biology in 2005 from the University of Chicago and her master's degree in biology in 2007 from Wake Forest University, Winston-Salem, N.C. As a UC Davis graduate student, she focused on the evolutionary relationships and genetic diversity of Baylisascaris procyonis, a nematode parasite of raccoons. Her career plans? Researcher in infectious diseases or genetics/genomics or a science communicator. 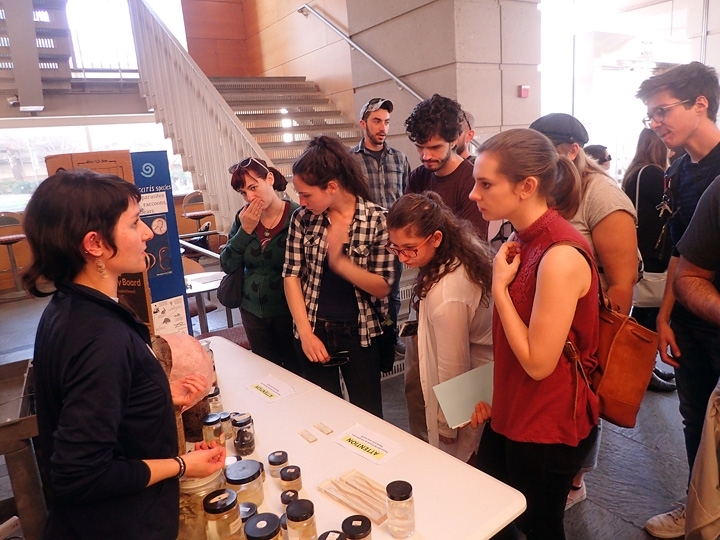 "I first became interested in parasites during my undergrad degree at the University of Chicago," Camp said. "My specific interest in nematode parasites developed when I read some of Dr. Nadler's work on the evolutionary relationships of nematodes for an invertebrate biology class. Nematodes are an amazing phylum of organisms- they exist in almost every known environment on the planet, and different species eat everything from bacteria and fungi to plant and animal tissue. I find parasites particularly fascinating, because they are dependent on another organism (or organisms) for part or all of their life cycle." The Bohart Museum event is free and open to the public. For the family craft activity, attendees will attach stickers of parasites on origami paper hats. The Bohart Museum, directed by Lynn Kimsey, UC Davis professor of entomology, is a world-renowned insect museum that houses a global collection of nearly eight million specimens. It also maintains a live “petting zoo,” featuring walking sticks, Madagascar hissing cockroaches and tarantulas. A gift shop, open year around, includes T-shirts, sweatshirts, books, jewelry, posters, insect-collecting equipment and insect-themed candy. The Bohart Museum's regular hours are from 9 a.m. to noon and 1 to 5 p.m. Mondays through Thursdays. The museum is closed to the public on Fridays, Saturdays and Sundays and on major holidays. Admission is free. More information on the Bohart Museum is available by contacting (530) 752-0493 or bmuseum@ucdavis.edu.